PXSe broadcast servers allow the integration of legacy radar systems with modern networks. Use our devices to ease TCP/IP or UDP/IP communication to transport control systems (e.g. rail) using synchronous protocols. We offer gateways from TCP/IP or UDP/IP to defense equipment using various kinds of synchronous protocols. 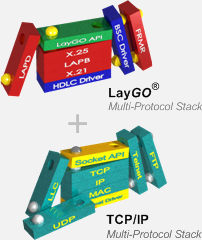 Advanced Relay develops products and solutions to exchange synchronous interfaces (RS-232/422, V.35) for Ethernet and synchronous protocols (X.25, LAPB, LAPD, RDIF, HDLC or BSC) for TCP/IP. Higher layer file transfer protocols for telecom phone switches, such as FTAM, AFT, XFER or AMATPS are replaced with FTP or SFTP.